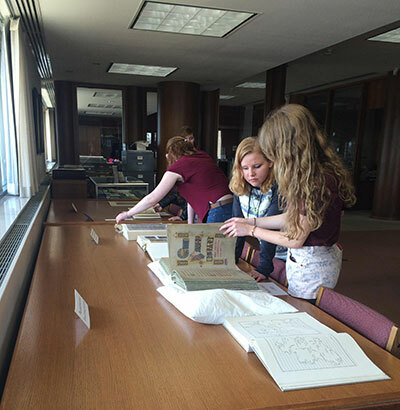 Senior Lecturer Michael Ashenbrenner’s ARTHIST 101: Ancient and Medieval Art and Architecture discussion sections visited the UWM Special Collections this week to view facsimiles of famous 7th-9th century illuminated manuscripts with teaching assistants Leigh Wilcox and Kara Hendrickson. Graduate student assistant, Hayley Jackson, introduced a brief history of the fall of the Roman Empire in the West and the rise of Roman style monasteries in the British Isles and later in France and Germany. Students also learned about the difference between the Hiberno-Saxon and Carolingian traditions of manuscripts by viewing several facsimiles of The Book of Durrow, the Lindisfarne Gospels, the Book of Kells, and the Lorsch Gospels.